Tasty Tuesday, a blog hop hosted by Sugar Golden Woofs and Kolchak Puggle, is the perfect opportunity to host a giveaway, and this month’s is a small dog treat giveaway! My apologies to big dog owners everywhere. Let’s take a look at the Jones Natural Chews we’ll be featuring for June. 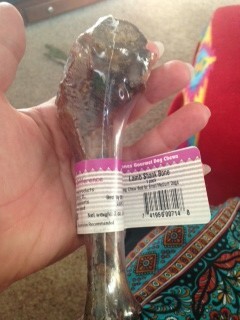 First up, Jones’ Lamb Shank Bone. Chewy called dibs on this bone. Its all natural goodness is great for any small dog. 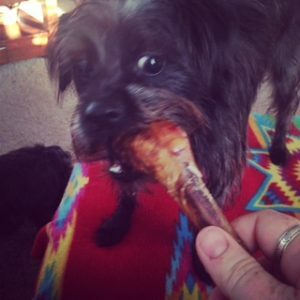 Chewy couldn’t wait to get his wee paws on the Lamb Shank Bone from Jones. He loves a good bone, and especially one designed for his ten pound Affenpinscher self. But wait! 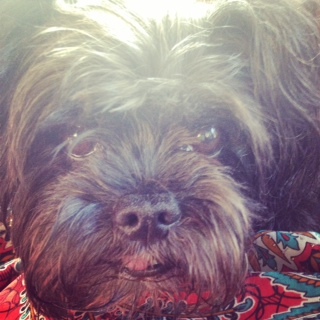 We have another Affenpinscher in the house! What would Scout like? Scout would like the Jones Rib Roller, for sure. Scout’s body language said “no touchee”, so I snapped a photo or two and left him alone with his Rib Roller. He’s a very happy little dog right now. And Chewy LOVED his Lamb Shank Bone. Gimme that Lamb Shank! 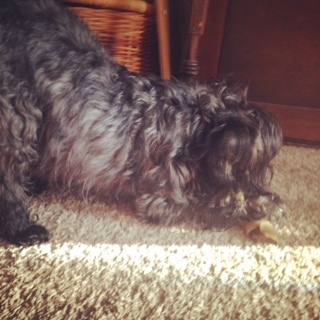 Chewy loves bones to begin with, and he seemed to appreciate that this bone was made for a dog his size. But what about my poor Aussies? Flash was taking a nap, but Patches, my delicate chewer, snagged herself a Rib Roller. Patches is a dainty girl and a delicate chewer for fifty pounds. She has no trouble with smaller dog bones, but only because I know her habits and still watch her like a hawk. So maybe you’re asking yourself, “Are those bones REALLY for small dogs? Is this really a small dog treat giveaway?” Yes, it really is. For medium to large dogs, and aggressive chewers, the Lamb Shank Bone especially will splinter. It’s a great bone for a small dog, though. 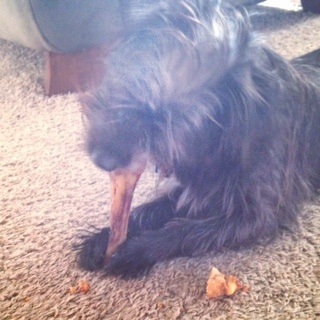 He’s been busy for the last twenty minutes, steadily chewing his Lamb Shank Bone. 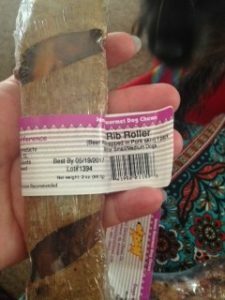 And the Rib Roller, while it’s a beef bone, is a beef rib, not suitable for larger dogs or aggressive chewers. I wouldn’t give the Lamb Shank to Patches, even dainty as she is, because it’s a more fragile bone, but neither would I give the Roller to any other dog Patches size, not knowing their chewing habits. Because Scout is a small dog, but I don’t know his chewing habits, he got the sturdier Rib Roller. This is Scout’s begging face. I think. Actually, he looks like this all the time. And yes, while I apologize for featuring strictly small dog treats this month, next month will be full of giveaways for our blogaversary! Not only here, but on some of your other favorite dog blogs. And there will definitely be treats for dogs of all sizes featured. The rules for snagging the treats featured in this month’s small dog treat giveaway? Okay, so that last one isn’t necessary, but I think you’ll love dogs if you’re entering this giveaway. Now! 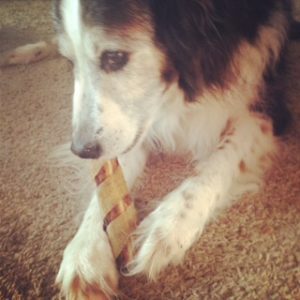 Give your dog a Jones Natural Chew! It’ll make your dog smile. I promise. You should be able to find them at a pet or feed store near you. Or at Natural Dog Treat Shop. And have a great day!